Last week, I had a visit from the Florida rep for Caesarstone. Caesarstone is a brand of manufactured quartz that gets used primarily as a counter surface. For anyone who doesn't know, Quartz is the new, at least in the US, category of counter materials. Quartz is made from stone aggregate and polymers and is essentially terrazzo. It is hard, resilient, stain and scratch proof. Its manufacturers also market it with some really wild claims that make it sound a lot better than it is. The truth of the matter is that it is a good product. But it is hardly perfect and it is certainly not going to replace the market for natural stone counters any time soon. Of the many brands of quartz out there, Caesarstone stands out. It's more expensive than most of the other brands and has a more adventurous palette than the rest of them as well. Caesarstone is harder to find and is unavailable in the big box stores. Caesarstone has a lot of cachet in the industry, and that's due in a large part to its unavailability outside of major markets. For a long time, anybody in Florida who wanted it had to go to Miami to get it. But no longer. Caesarstone is now available to those of us who find ourselves in second-tier cities like mine. I've long admired Caesarstone for their lime greens and bright oranges and now I have a sample kit of my very own. Hot dog! In addition to having more interesting colors than their competitors, Caesarstone's been experimenting with more adventurous finishes too. Some of their concrete- and soapstone-looking materials are really intriguing and well worth looking into if you're in the market for new counters. Something I've always noticed is the way Caesarstone positions itself too. Silestone, Zodiaq, Cambria, Avanza and the rest of them refer to themselves as an alternative to granite. Caesarstone tends to stand by itself and assert that it's a good product without having to draw comparisons. I think this is a more respectable and honest tack. The truth of the matter is that quartz and granite aren't interchangeable. There are some designs that call for one and not the other. Similarly, there are people for whom quartz isn't appealing or appropriate no matter what kind of smoke DuPont is blowing in its latest ad campaign. 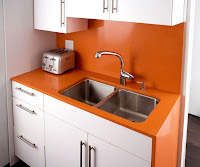 So if the quest for new and different is making you look askance at granite counters, you may do well to take a look at Caesarstone --especially their color Tequila Sunrise.